Hearts Uche Ikpeazu scores past Aberdeens Joe Lewis to make it 2-1. A typical Tynecastle tussle ended in defeat for the Dons as they lost their composure in a punishing second half at Hearts. The Dons were well worth their half-time lead but the wounds at full-time were self-inflected from Derek McInnes’ side as they let Hearts back in the game with one rash challenge before gifting their hosts the winner in calamitous fashion. 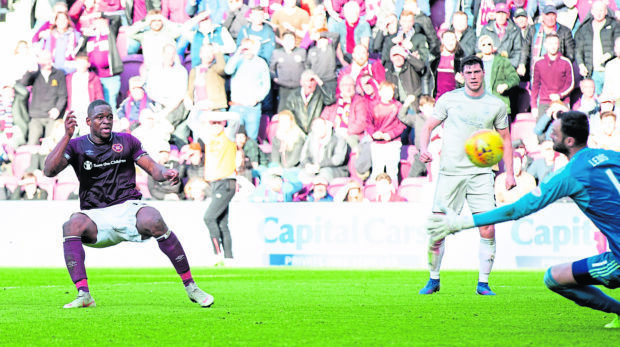 Aberdeen trips to Tynecastle are always fiercely competitive affairs and this one was no exception with the physical contest between two robust characters, Scott McKenna for the Dons and Hearts striker Uche Ikpeazu, quickly becoming the focal point of a feisty encounter in the capital. It was the Jambos’ imposing forward who would have the final say. In the first half Aberdeen were fluent, especially in the wide areas with Niall McGinn and Connor McLennan enjoying success down the wings and their strong start to the game was rewarded with the opening goal. It came from the visitors’ third corner with McGinn’s delivery met by Sam Cosgrove. His towering header came back off the crossbar but McLennan reacted quickest to head the ball past Zdenek Zlamal in the Hearts goal to give his side a deserved lead. The Dons could easily have added to their opener with Cosgrove seeing his header tipped over the crossbar by Zlamal before the goalkeeper punched a way a long range effort from Graeme Shinnie as Aberdeen pushed for a second goal. Hearts had to improve and frustratingly for the visitors, they conceded the equaliser from a position of strength. They were on the attack before Jake Mulraney gained possession 30 yards from his own goal. The former Caley Thistle winger ran unchallenged until Andy Considine stuck out a leg to send him sprawling just inside the Aberdeen box to give referee John Beaton an easy decision in pointing to the spot for a spot kick. Sean Clare duly converted to restore parity between the sides. Home fans appealed for a second penalty minutes later when Ikpeazu went down in the box under a challenge from Lewis but referee Beaton booked the forward for simulation. There was no doubt this game had swung in the home side’s favour and it was the visitors’ concentration which wilted as Andy Considine and McKenna combined to gift the home side a second. A long ball forward was missed by Considine and Ikpeazu spun away. McKenna was covering but he too missed the ball and from nowhere the Hearts striker was through on goal and scoring. Within seconds the joy at scoring was replaced by agony as he suffered a concussion. The drama was not finished there, however, as both sets of players became embroiled in a melee after Clare went down under a challenge from Dom Ball. The Dons man was unimpressed, rolling the prone forward over on the turf, to tell him that. By the time calm was restored Aberdeen’s hopes of forcing an equaliser had gone.